Etta Marie (Swift) Swanson, daughter of John Clifton and Susie Marie (Erickson) Swift, was born on December 7, 1935 on the family farm southeast of Yorktown, Iowa in Page County. She entered into rest on Monday, October 29, 2018 at Garden View Care Center in Shenandoah, Iowa at the age of 82 years, 10 months, 22 days. At the age of two, her family moved to a farm south of Shenandoah. At age seven, they moved into Shenandoah where Etta attended the Shenandoah Community Schools, graduating from Shenandoah High School with the Class of 1953. Following graduation, Etta worked as a receptionist at Iowa Finance in Shenandoah for four years. On January 29, 1956, Etta was united in marriage to Merrill Dean Swanson at the Emmanuel Lutheran Church in Shenandoah. To this union two children, Kevin and Nancy were born. They purchased the family farm six miles east of Essex in 1965. Etta was a devoted wife and mother. After retiring from farming they moved into Shenandoah in the spring of 2006. 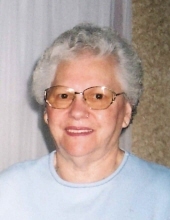 A longtime member of Emmanuel Lutheran Church in Shenandoah, Etta was a member of their Women's Circle, was a Sunday School Teacher and served on many other committees. She also volunteered at Garden View Care Center and the Special Olympics. Preceding Etta in death were her son, Kevin Swanson; parents; and brother, John C. Swift. Left to cherish her memory is her husband of over 62 years, Merrill Swanson of the home; daughter, Nancy Wilson and her husband Darrell of Quincy, IL; two grandsons, Blake Wilson and his wife Kassidy of Edwardsville, IL and Logan Wilson and Caitlin Arnold of Morrison, CO; great granddaughter, Kalylah Wilson of Edwardsville, IL; two sisters-in- law, Mavis Herzberg and her husband Darrel of Villisca, IA and Gloria Swift of Wheatland, WY; nieces and nephews, Diane Shipley and husband Bill of Nodaway, IA, Chris Herzberg an wife Jami of Charlotte, NC, Steven Herzberg of Ankeny, IA, Dwight Swift and wife Cindy of Colorado Springs, CO, Paula Ann Swift of Bountiful, UT and Darwin Swift of Bristow, VA; aunt, Alice Erickson of Essex, IA; many great nieces, nephews and cousins; other relatives and many friends. Funeral services will be held on Friday, November 2, 2018 at 2:30 pm at the Nishna Valley Funeral Home with Pastor Kurt Hoover officiating. The family greet relatives and friends with visitation from 1:30 to 2:30 PM prior to the service at the funeral home. A memorial is being established in Etta's name. Burial will take place in the Rose Hill Cemetery in Shenandoah. Survivors include her husband of over 62 years, Merrill D. Swanson, of Shenandoah.